There are plenty of stories floating around out there about tickets to the Men's Final Four this weekend, and to sum them all up, "You can get tickets if you have money." Beyond that, there are actually a couple of interesting story lines involving tickets. 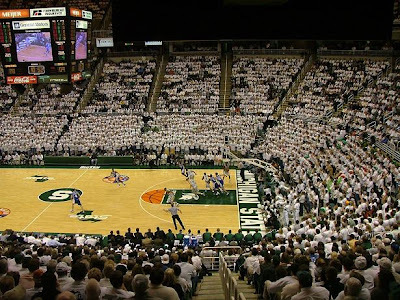 The first is the Izzone snafu mentioned in the last post. This story isn't a big deal to many people, but to members of the Izzone, it most certainly is. Apparently when the Student Alumni Foundation sent an email to Izzone members about tickets, it contained a faulty link to the online ticket site that was contracted by the NCAA. The situation was fixed, but not everyone could be notified in time (or it was not fixed for everyone, do we ever really know when it comes to computers?). This led to a number of eligible Izzone members who felt they were not given a chance to get tickets. The situation was compounded by unconfirmed rumors that because SAF members knew the correct link first, they and their friends, and their friend's friends were the ones who actually purchased all of the tickets as the link spread by word of mouth. While not confirmed, this is not an unrealistic scenario. Another situation is involving the number of allotted tickets and hotel rooms. According to the Lansing State Journal, each school's overall ticket allotment is 3,250. This is down from 4,500 in 2005 even though Ford Field holds many more people than any previous arena used to host the Final Four. This simply means less tickets for everyone associated with the program, including students families and friends, MSU administration, donors, past players, local celebrities, etc. Compounding the problem is that each school is on the hook for 500 hotel rooms for four nights each. It seems that many of the State fans don't really feel like spending that much time in Detroit (or simply don't need the room and don't want to pay for it). Unless MSU can work something out, the athletic department is on the hook for the cost of those rooms. It was suggested to me that they could offer the rooms to fans of other schools who do need to travel, but then again, wouldn't that hurt our home court advantage? Finally, Tom Izzo was asked in his Tuesday press conference about ticket requests. He said that he has been overwhelmed by ticket requests, and has found an easy way to handle it. He said he has basically stopped checking his email and phone messages, using the theory that he doesn't have to say no if he never gets the message in the first place. So if your work buddy promised you a ticket because he's got that "awesome connection with Izzo," you might just want to look into plan B.